Backdrop is an open source and free content management system (CMS). It is fork of Drupal, mobile-friendly, and fast. You don't need to know any programming language for using Backdrop CMS. 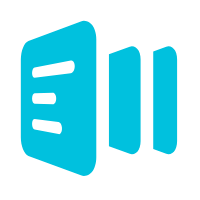 You can easily create, edit, and manage your content. Backdrop CMS provides you with a multi-level user experience. This means that you can set different levels of permissions to different people. Backdrop CMS has add-ons, plugins, themes and layouts. You can use them directly; you don't need to search for other add-ons or themes. Even if you need to modify its API, you can do this according to your needs. If you are using Drupal 7, you can upgrade to Backdrop CMS with its built-in upgrade path from Drupal 7. Backdrop is compatible and works well with Alibaba Cloud Elastic Compute Service (ECS) servers. As a developer, I prefer the services of Alibaba Cloud to host my Backdrop CMS. Alibaba Elastic Compute (ECS) is highly flexible and you can upgrade the hardware resources anytime when you get more traffic. Backdrop CMS does not restrict its installation to any specific operating system (OS). You can use any operating system (OS) of your choice; however, the installation steps would vary according to the choice of operating system. 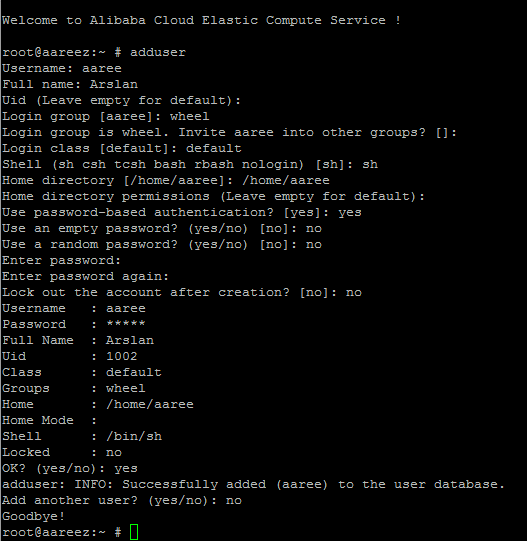 In this tutorial, I will be using Alibaba Cloud Elastic Compute Service (ECS) with FreeBSD 11.1 installed on it. 1.You must have Alibaba Cloud Elastic Compute Service (ECS) activated. If you are a new user, you can Free Credits in your Alibaba Cloud account. If you don't know about how to setup your ECS instance, you can refer to this tutorial or check quick-start guide. 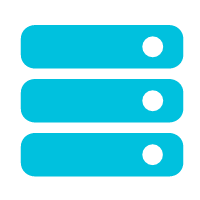 2.You should setup your server's hostname. 3.Access to VNC console in your Alibaba Cloud or SSH client installed in your PC. After completing the prerequisites, login as root user with your root username & password via SSH client (e.g. 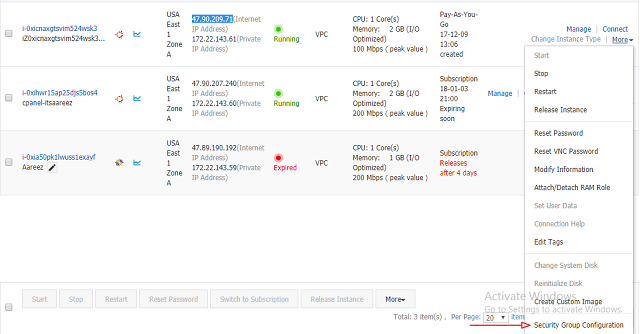 Putty – You can get Putty from https://www.putty.org ) or VNC console available in your Alibaba Cloud account dashboard. 2.You will be prompted to give permission to proceed installation. Type 'y' and hit Enter key. 2.For Username, type your selected username and hit Enter key. 3.For Full Name, type your full name and hit Enter key. 4.For Uid, leave the field empty and hit Enter key. 5.For Login group, type wheel and hit Enter key. 6.For Invite username into other groups?, leave blank and hit Enter key. 7.For Login class, type default and hit Enter key. 8.For Shell, type sh and hit Enter key. 9.For Home Directory, type /home/your_username and hit Enter key. 10.For Home Directory Permissions, leave the field blank and hit Enter key. 11.For Use password-based authentication, type yes and hit Enter key. 12.For Use and empty password, type no and hit Enter key. 13.For Use a random password, type no and hit Enter key. 14.Now you will be prompted to enter password. Type password of your choice and hit Enter key. 15.Retype the password and hit Enter key. 16.For “Lock out the account after creation?, type no and hit Enter key. 17.For OK?, type yes and hit Enter key. 18.Now you will be asked to add another user, type no and hit Enter key. 19.New user with sudo/admin rights have been created successfully. Note: “aaree” can be any username of your choice. The above screenshot shows that username “aaree” is part of “wheel". 21.Now you will need to edit sudoers file to uncomment the line shown in screenshot below to give sudo rights to wheel group. For this, we will check /etc/sudoers file and see whether sudoers group is enabled or not. For this purpose, we will execute the following command. 22.After executing the above command, you will see the following lines in the opened file. Remove the # from its start to uncomment the line. Otherwise, your username will not be able to execute sudo command. To remove this, make your cursor on # and press r key and then press spacebar key. After it type :x and hit Enter key to save changes. To verify from which account, you have been logged in, type the following command and hit Enter key. Now, you will be prompted to type your password to confirm. Type your password and hit Enter key and wait until your screen shows status “Complete!”. You will be prompted to proceed with this action, type 'y' and hit Enter key. You may be prompted to enter your password. Now type your password and hit Enter key. Now you will be asked to enter y/N, type 'y' and then hit Enter key and wait for updating. 2.Apache Web Server has been installed successfully. 4.Now execute the command below to start Apache service. You may be asked to enter password again. 5.To ensure that you have installed Apache correctly, you can check by accessing your IP through your browser. You should see the following page. Note: The configuration for DocumentRoot should look as given below. 7.Now we need to enable mod_rewrite. To load mod_rewrite, you will need to uncomment the following line in Apache configurations. This line is commented by default. To load mod_rewrite, remove # to uncomment this line. To do so, point the cursor to # and press r and then press spacebar key. Now type :x and press Enter key to save your changes. 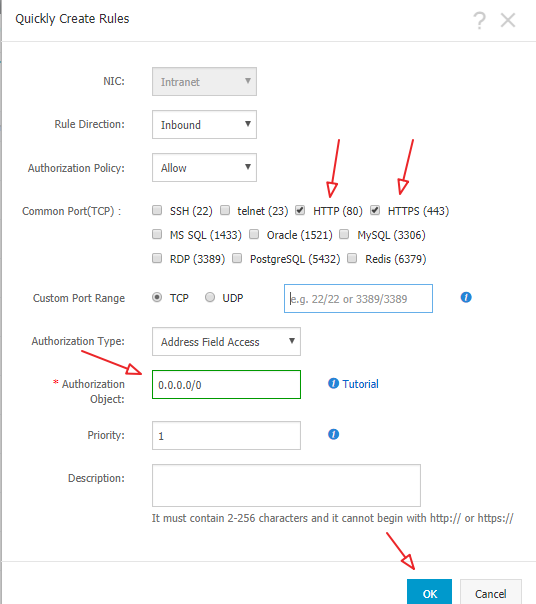 If you have activated firewalls, you will have to define a rule in Alibaba Cloud security group for your cloud server to add exception for port 80/tcp, 443/tcp. You can enable these ports while creating ECS instance, but in case, if you have forgotten to unblock these ports, you can follow the procedure below. By default, these ports are blocked by the firewalls. 3.Click on Quickly Create Rules. 4.Add the configurations as shown in screenshot below & click OK.
1.Now you will have to install PHP 7.1 along with its required modules necessary for Backdrop CMS. To do this, execute the following command. 2.You will be prompted to proceed with the above action. Enter y and hit Enter key to proceed. Now add the following text in opened file and type :x and hit Enter key to save the file. Alibaba Cloud AsparaDB for RDS is a good alternative and I highly recommend it. 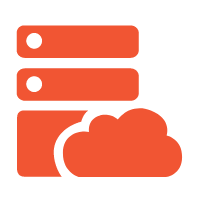 Alibaba Cloud AsparaDB for RDS frees you from managing a database and you can focus on your business. It is a ready to use service. It provides protection against SQL injections, network attacks, brute force attacks and many other types of database attacks. It is highly scalable, available and secure with ease of use. 2.You will be prompted to ask whether to take action or not. Type y and hit Enter key. MariaDB Server has been installed successfully. The root password will be blank by default, just hit enter button to proceed and select 'Y' and choose your password. 2.Now the command prompt will ask you to enter password for user 'root'. Enter the password and hit enter key, you will be prompted to MariaDB command prompt. where backdrop_db can be changed to your desired name database name and backdrop_user can be changed to your desired username. 3.Now use the following command to get Backdrop CMS package for installation. If the above command gives any error, or you need to install latest version of Backdrop CMS, click here to get the link of latest version. Congratulations! 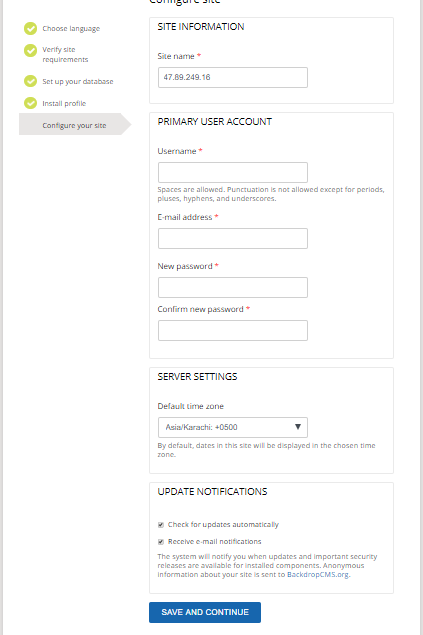 It's time to access your Backdrop CMS via IP address. 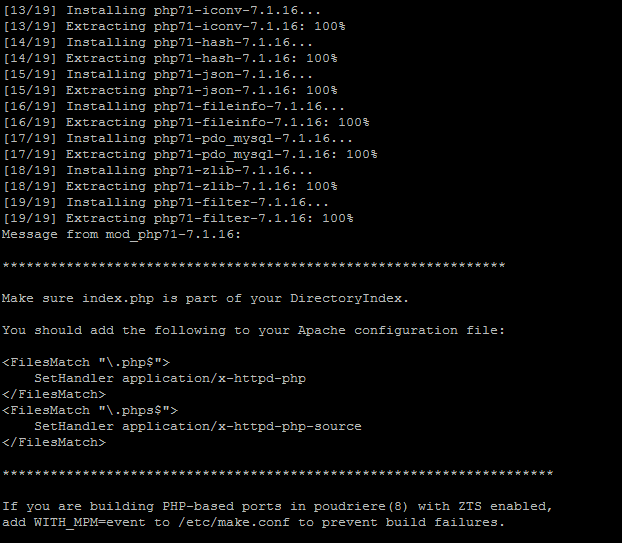 1.Before opening installation file of Backdrop CMS, you will have to confirm database settings in settings.php file. 2.Find the line below in the opened file and edit it to update your database settings and type :x and then hit Enter key to save changes. 3.To access Backdrop CMS, use the IP address of your ECS in your browser's address box and hit enter. My ECS IP address is 47.89.249.16. 4.Click Save and Continue to proceed installation of Backdrop CMS. 5.After completion of installation, you will see the following form. Fill the details regarding your website and setup web admin credentials and then press Save and Continue.